In the beginning Shigetaka Kurita created emoji on NTT Docomo phones in Japan. Now the emoji was limited and small, text was still pervasive, and the upcoming influence of the people was hovering over the waters. And the people said, “Let there be more emoji,” and emoji was added to other carriers. The people saw that the emoji was good, and separated the emotions from the text. And the people said, “Let there be a way to include emoji on phones in other lands.” So emoji made the transition to Unicode. And it was so. And the people said, “Let the emoji be more representative so the people aren't all white.” And it was so. We called the default skin tone a “non-human shade” which was generally yellow. And options were added for diversity and this was called "skin tone modifiers.” And the people saw that it was good. Then the people said, “Let us make emoji in our image, in our likeness” and we added gendered versions of each emoji; male and female we created them. The people saw all that we had made, and it was very good. A list of new female and male emojis was published by Unicode earlier this month, which paves the way for vendors to support these in late 2016. 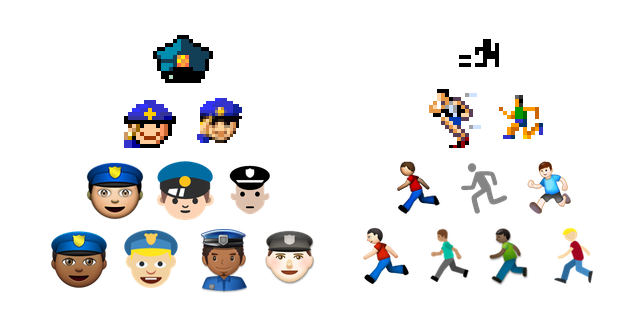 Unicode itself does not normally specify the gender for emoji characters: the emoji character is 🏃 Runner, not Man Running; 👮 Police Officer not Policeman. To get a greater sense of realism for these characters, however, vendors typically have picked the appearance of a particular gender to display. This has led to gender disparities in the emoji that people can use. Vendors cannot have both a male and female version of each one. Having greater representation of women in meaningful roles in emoji has been widely welcomed, but not by everyone. As part of Unicode's efforts to diversify the emoji range to include more female representation, feedback can submitted. I firmly believe that Unicode should refrain from adding any more emoji with explicit gender and I'm not the only person to do so. Particularly highlighted is the fact that some emojis are excluded from list of gendered emoji additions such as 👰 Bride With Veil, 👲 Man With Gua Pi Mao and 🤰 Pregnant Woman. I suggest reading the full feedback for a more detailed view. The method of updating emojis does permit a gender-neutral fallback. It's less defined than Female or Male are, but permitted nonetheless. While I have focussed on some of the gender issues raised here — and these are valid and succinctly written — the broader issue of representation in emoji remains. Foods, objects, clothing, gestures, sports: there is so much diversity in the world, yet there are real technical and practical limitations surrounding just how many new emojis can be supported in future. The most pragmatic approach is about priorities. Start with the most pressing issues, and then address the next. Just because increasing representation in emoji can be difficult to do, it doesn't mean we shouldn't try. 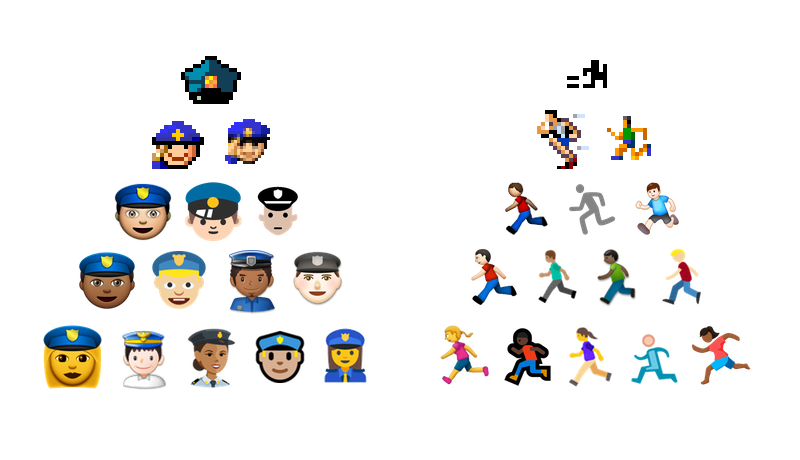 The longer-term goal for implementations should be to support embedded graphics, in addition to the emoji characters. That's a topic for another day, but it does indicate a potential future where anything and anyone can be represented. Note: The first footnote in this article below was updated in March 2019 to reflect the fact that the NTT Docomo emoji set was not the first, though it arguably might have been the first widespread emoji set in Japan.